Granted, prophesying the future of banking amid powerful industry-shaping dynamics across and within varied markets could be considered an act of futility. However, there are hard indications—from Open Banking to core IT alternatives and hungry newcomers taking noticeable share—that 2019 could be a tipping-point year for retail and commercial banking. Drawing on many and diverse project experiences and conversations with senior executives in the industry, I’ve put together some of my thoughts on how this might play out and the key issues that could be most important for executives this year. 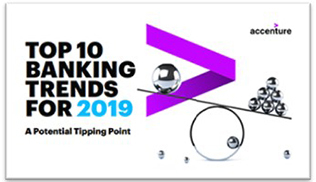 Have a look at our top 10 trends that bankers should pay attention to in 2019 or see more at my Forbes blog. I welcome your reaction and any subsequent spirited discussion. Does your bank have what it takes to be digital—inside and out? Next Post - What is the business case for real-time payments? Suggested Post - What is the business case for real-time payments?